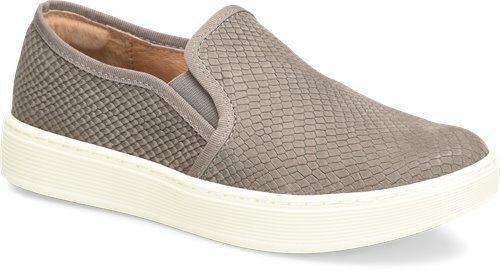 An on-trend sporty slip-on with exotic texture. Sofft does not disappoint, its a comfortable shoe ! Very pleased with purchase! The shoes look great first off, and are incredibly comfortable. I've walked in them all day, out running errands and shopping for several Saturdays now, and no complaints. I wear 9 M. I swapped them for 8.5. They are still a bit long and are for sure narrow. My advice is to order 1 size smaller than you wear. These run long and narrow. But I do get lots of compliments on them. I'm happy with the purchase.